Maa Durga manifests herself in nine form called Navdurga. One of these nine forms of Maa Durga is worshiped every day in Navratri. The fisrt form of Maa Durga known as “Shailputri”. Goddess Durga was born in the house of King of Mountains “Parvat Raj Himalaya”, so she is called “Shailputri” maens the daughter of mountain. Maa Shailputri is the absolute from of Mother Nature. She is also known as Goddess Parvati the consort of Lord Shiva & mother of Ganesha and Kartikeya. In the Navratra festival the worshiping Mother Goddess has a half moon in her forehead & she is holding a trident in her right hand & lotus flower in her left hand. she rides on mount Nandi a bull. In some scriptures like Shivapurana & Devi Bhagvatam the story of Mother Goddess is written as follow: Maa Bhagwati in her earlier birth was born as a daughter of Daksh Prajapati. Then her name was ‘Sati’ and she was married to Lord Shiva. But in a sacrificial ceremony organized by her father Prajapati Daksh, she got her body burnt in the yogic fire, because she could not bear the insult of her husband Lord Shiva by her father Prajapati Daksha in the sacrificial ceremony. In her next birth she incarnated her as Goddess Parvati, the daughter of Parvatraj Himalaya and among Nava Durgas she has been referred to as Sailaputri who was again known as Himavati. In her Haimavati aspect she defeated all prominent gods. Like her previous birth in this life also Maa Shailaputri (Parvati) got married with Lord Shiva. 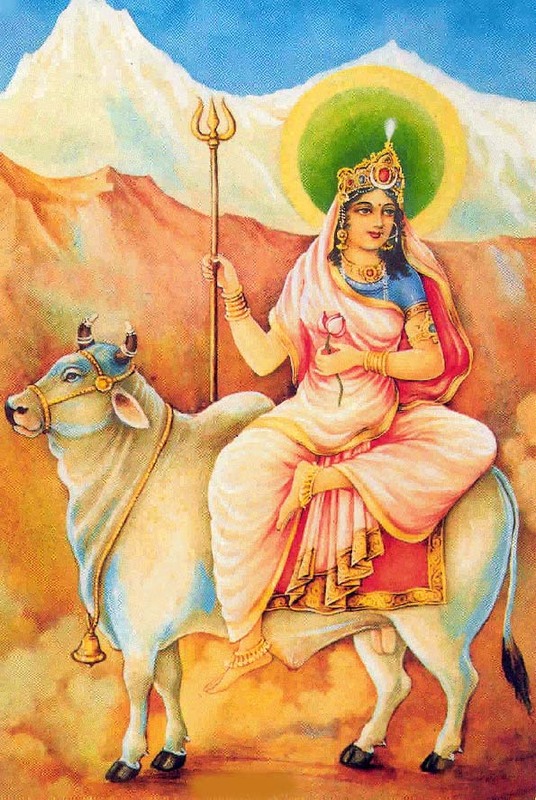 The first and the most prominent among Nava Durgas, Shailaputri is of immense importance and her glories are endless. On the first day of Navratra worship it is she who is worshiped. She is the Devi of the root chakra, who, upon awakening, begins Her journey upwards. Sitting on Nandi, and making her first journey from the Muladarachakra. As from her father to her husband – the awakening Shakti, beginning Her search for Lord Shiva or making a move towards her Shiva. So that, In navrati pooja the first day Yogi’s keep their mind concentrated on Muladhara. This is the starting point of their spiritual discipline. They started their Yogasadha from here. Shaila Putri is the Mooladhara Shakti to be realized within Self and sought for higher depths, in the yogic meditation.